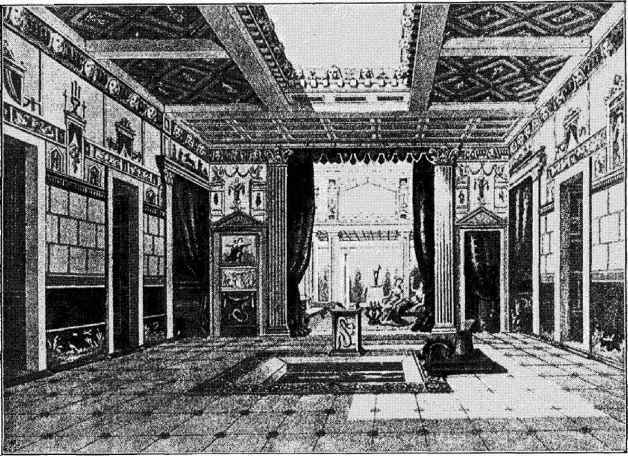 An early reference to Greek furniture is made by Homer, who describes coverlids of dyed wool, tapestries, carpets, and other accessories, which must therefore have formed part of the contents of a great man's residence centuries before the period which we recognise as the "meridian" of Greek art. In the second Vase-room of the British Museum the painting on one of these vases represents two persons sitting on a couch, upon which is a cushion of rich material, while for the comfort of the sitters there is a footstool, probably of ivory. 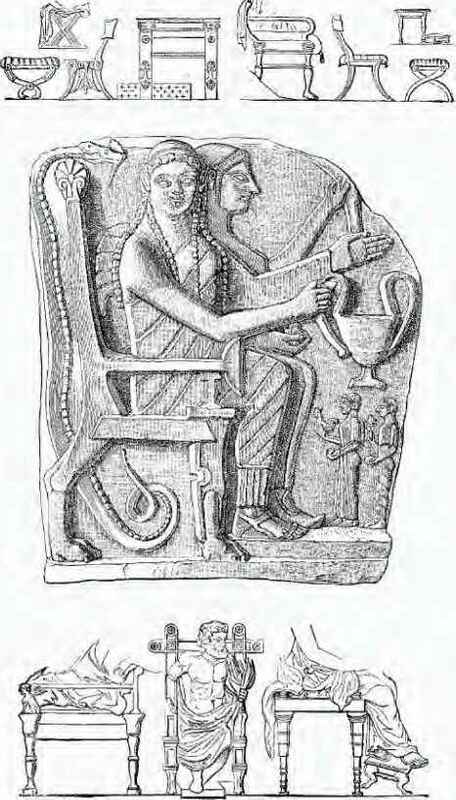 On the opposite leaf there is an illustration of a has relief in stone, "Bacchus received as a guest by Icarus," in which the couch has turned legs and the feet are ornamented with carved leaf work. We know, too, from other illustrations of tripods used for sacred purposes, and as supports for braziers, that tables were made of wood, of marble, and of metal; also folding chairs, and couches for sleeping and resting, but not for reclining at meals, as was the fashion at a later period. 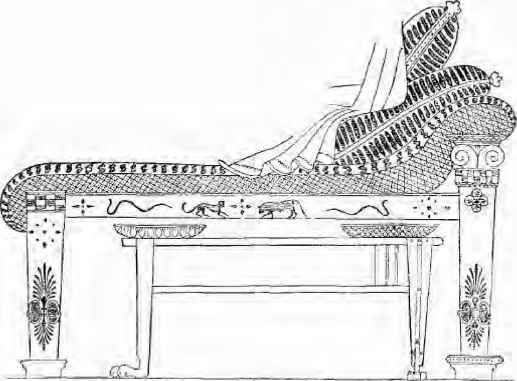 In most of the designs for these various articles of furniture there is a similarity of treatment of the head, legs, and feet of lions, leopards, and sphinxes to that which we have noticed in the Assyrian patterns. The description of an interesting piece of furniture may be noticed here, because its date is verified by its historical associations, and it was seen and described by Pausanias about 800 years afterwards. This is the famous chest of Cypselus of Corinth, the story of which runs that when his mother's relations, having been warned by the Oracle of Delphi, that her son would prove formidable to the ruling party, sought to murder him, his life was saved by his concealment in this chest, and he became Ruler of Corinth for some 30 years (B.C. 655-625). It is said to have been made of cedar, carved and decorated with figures and bas reliefs, some in ivory, some in gold or ivory part gilt, and inlaid on all four sides and on the top. The peculiar laws and customs of the Greeks at the time of their greatest prosperity were not calculated to encourage display or luxury in private life, or the collection of sumptuous furniture. Their manners were simple and their discipline was very severe. Statuary, sculpture of the best kind, painting of the highest merit—in a word, the best that art could produce—were all dedicated to the national service in the enrichment of Temples and other public buildings, the State having indefinite and almost unlimited power over the property of all wealthy citizens. The public surroundings of an influential Athenian were therefore in direct contrast to the simplicity of his home, which contained the most meagre supply of chairs and tables, while the chef doeuvres of Phidias adorned the Senate House, the Theatre, and the Temple. There were some exceptions to this rule, and we have records that during the later years of Greek prosperity such simplicity was not observed. Alcibiades is said to have been the first to have his house painted and decorated, and Plutarch tells us that he kept the painter Agatharcus a prisoner until his task was done, and then dismissed him with an appropriate reward. Another ancient writer relates that "the guest of a private house was enjoined to praise the decorations of the ceilings and the beauty of the curtains suspended from between the columns." This occurs, according to Mr. Perkins, the American translator of Dr. Falke's German book "Kunst im Hause," in the "Wasps of Aristophanes," written B.C. 422. 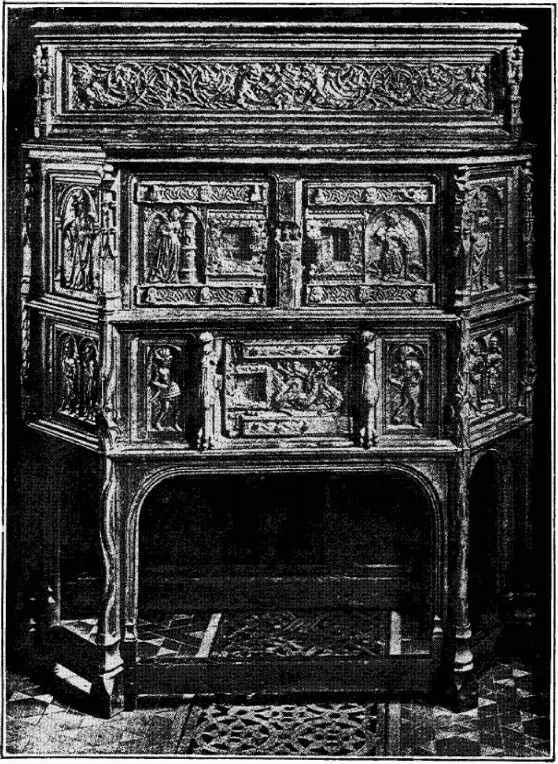 The illustrations, taken from the best authorities in the British Museum, the National Library of Paris, and other sources, shew the severe style adopted by the Greeks in their furniture. As we are accustomed to look to Greek Art of the time of Pericles for purity of style and perfection of taste, so do we naturally expect the gradual demoralisation of art in its transfer to the great Roman Empire. From that little village on the Palatine Hill, founded some 750 years B.C., Rome had spread and conquered in every direction, until in the time of Augustus she was mistress of the whole civilised world, herself the centre of wealth, civilisation, luxury, and power. Antioch in the East and Alexandria in the South ranked next to her as great cities of the world. From the excavations of Herculaneum and Pompeii we have learned enough to conceive some general idea of the social life of a wealthy Roman in the time of Rome's prosperity. The houses had no upper story, but were formed by the enclosure of two or more quadrangles, each surrounded by courts opening into rooms, and receiving air and ventilation from the centre open square or court. The illustration will give an idea of this arrangement. In Mr. Hungerford Pollen's useful handbook there is a description of each room in a Roman house, with its proper Latin title and purpose; and we know from other descriptions of Ancient Rome that the residences in the Imperial City were divided into two distinct classes—that of domus and insula, the former being the dwellings of the Roman nobles, and corresponding to the modern Palazzi, while the latter were the habitations of the middle and lower classes. Each insula consisted of several sets of apartments, generally let out to different families, and was frequently surrounded by shops. The houses described by Mr. Pollen appear to have had no upper story, but as ground became more valuable in Rome, houses were built to such a height as to be a source of danger, and in the time of Augustus there were not only strict regulations as to building, but the height was limited to 70 feet. The Roman furniture of the time was of the most costly kind.